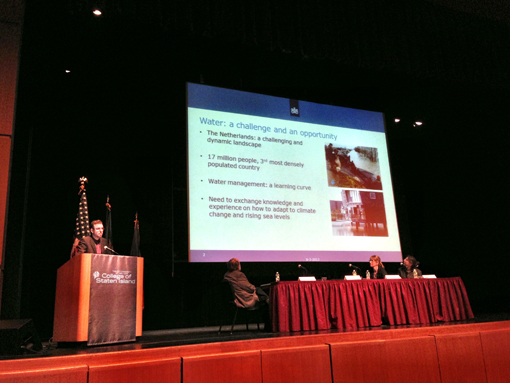 On March 8th, 2013, hundreds of people attended the Superstorm Sandy Forum that was held at the College of Staten Island. The reason for this forum was to educate the public on the following topics: the nature of hurricanes, protection from hurricanes, risks associated with flooding, zoning and land use issues, social science, financial impact, recovery, protection of natural resources and building codes. The forum lasted over 6 hours and included representatives from the federal, state, city, and local entities, as well as leading scientists, business people, and educators from around the world. The informative day-long program discussed coastal flooding risks, storm surge impacts, effects of the tide, local geographic, safety precautions and strategies for rebuilding Staten Island. “Global climate change is one of the most pressing challenges facing coastal decision makers today. The science community no longer debates whether climate change is happening; they debate the rate at which the change is occurring. Increased storm frequency and intensity, coastal inundation, species range extensions and shoreline erosion are issues all communities are facing” said one of the panelists at the forum. As a result of the last few storms many now realize that New York City is in the hurricane belt and believe that we will be hit again in the future. Since it’s very difficult to predict the next natural disaster we should be focusing on how to build up and significantly improve the ability of our city to weather any type of storm. During the Superstorm Sandy forum landscape architects urged us to protect our existing wetlands, consider rezoning high-risk areas for day use and recreational purposes and rebuild by elevating homes to prevent damage from future floods on Staten Island. There were many proposed sketches for raising the houses in the low lying areas as seen below. The last panel Role of Government and Finance in Sandy Recovery on Staten Island consisted of the following local officials: Nicole Malliotakis – Assembly-member, James Oddo – Councilmember, Seth Pinsky – President, Mayor’s City’s Special Initiative for Rebuilding and Resiliency. This panel continued the discussion addressing rebuilding and elevation, insurance, strengthening the infrastructure, support for local businesses, the issue of mold, and the financial help from the government for recovery. For more information on this forum and topics that were covered please visit Sandy Forum Resource Kit. Disaster assistance handouts that were given out at the Superstorm Sandy Forum.